If you have never had the chance to visit Africa’s savannah, Bally Wulff will ensure you get the virtual experience thanks to its newly-created video slot- Thunderhorn. The five reel, 1024 payline slot will reward you with free spins along with multipliers. So, put on your sunhat and get your hunting materials ready because you are about to go deep in the grassland to meet the great rhino. Ever watched the animal channel on Sky TV? Rather, have you ever been on African plains? If you have, then you know how it feels like walking in an unknown territory with all these wild animals. The rugged mountains in the background contrasts with the plain white and cream background to the reels expresses a classic look. By now, you will understand how it feels like to go on a safari. 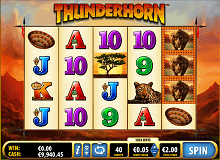 The Thunderhorn slot allows you to take a walk into the deep savannah to experience the wild nature of animals and plants. While at it, use the five reels and 1,024 play lines to boost your winnings. As you walk deep into the grassland territory, you will experience some dry spells before you become a winner. Since it is considered a game of high variance, it is possible to make lots of money; with great caution of course! The strategy is to put the multipliers together once you have activated the free spins feature. 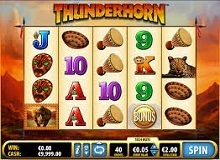 As with most casinos, Thunderhorn casino slot online offers you the chance to tailor the coin sizes to suit your budget. Whenever you are ready, press the spin button. Due to its high volatility, it is easy to enjoy large wins and strings of low payouts as well. If you get three bonuses, you will qualify for eight free spins, four will reward up to fifteen free spins while five bonuses are equal to twenty free spins. Be on the lookout for more offers during this trail. Anytime the wild symbols appear anywhere on the three reels, it will multiply using the same spin. If they appear concurrently as the multiplier, then you are in for great results. So, you need to locate a two times multiplier along with a three times multiplier combinations on the same spin so that it will buffer the winning payout by six times. The Bonus round allows you to activate the free spins. You will realize this once you see the rhino running across the reels. Thereafter, an African shield/ mask will replace it which is marked by a night version. Two bonuses form an equivalent of five extras, and three offers eight while four gives 15 extras. Try as much as you can to land five of them to receive twenty bonus games added on top. Whenever you land a win, you will see fireworks to both sides of the reels to give you a multiplier for that particular win. If you fail to activate a win for any swirl, these images will not appear on your screen. These and many tips will help you to land a deal of a lifetime. Initially, this game was only available in casinos. Now, you can comfortably play for free since they aren’t available for free money at the moment. By taking part in this game, you will relieve all those treasured moments of playing video games in renowned casinos. 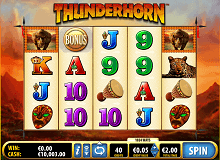 If you want to play Thunderhorn free slot for real money, you need to reside in an area where online gambling is allowed. You have better chances of playing the game without any restrictions as long as you live in the UK where it is regulated online. Residing in Australia or Canada means you can only access the game in land-based casinos. They will have to abide by the rules until it reaches a point where casinos online are plenty in number without creating space for cheats. The Thunderhorn game is one of the best you can ever participate in as a player. The gameplay is rather easy to understand. Besides an RTP of 94.03% and unknown jackpot, you have every right to enjoy the free spins, multipliers, wilds, and bonuses. So, you can win pretty much everything if you watch your steps.